Michigan Governor Rick Snyder signed prolife omnibus House Bill 5711 on Friday, December 28, giving prolife people in Michigan a huge victory for the cause of life. H.B. 5711, a.k.a. the Prolife Bus, addresses the persistent pattern of neglect in regulating abortion clinic practices in Michigan. There was a long overdue need for governmental reforms because women's safety was being compromised. In addition to clinic regulations, H.B. 5711 will prevent women from being coerced to abort, end the shameful practice of disposing aborted babies in trash bins, and prevent the abortion chemical RU-486 from being facilitated over the Internet. MLive has a story on the abortion clinic in Muskegon which has been closed by the city's fire department and building inspector. A reporter with MLive and The Muskegon Chronicle was unable to make contact with an official with the clinic. An email seeking comment also was sent but no reply was immediately received. Lewis said Muskegon police officers noticed the alleged violations when they responded to the facility on an unrelated service call. He said they entered the building and noticed some items that drew their attention, so they contacted the fire marshal. The fire marshal and building inspector later investigated and issued the order revoking the clinic's occupancy permit, he said. Lewis said the city has attempted to contact the owner, whose name is not being released at this time, and the order closing the facility was posted. He said Public Health-Muskegon County also has been contacted. Prolife legislation in Michigan must be doing something good if the New York Times editorial board deems it worthy enough to attack in an editorial. According to the New York Times editorial board, safety rules to regulate and inspect abortion clinics and rules that save prolife women from being forced to pay for abortions through their insurance plans are actually an "affront" to all Michigan women. The Times editorial also shows they favor allowing abortionists to prescribe dangerous abortion drugs to women without ever physically examining them and seem to think the majority of abortion clinics do cancer screenings. An abortion clinic located in Muskegon, Michigan has been boarded up and a sign notes the building "shall not be occupied until approval has been granted by the Fire Prevention Bureau of the City of Muskegon." The sign is dated December 26, 2012. During the 37th week of pregnancy, the baby begins positioning her head down in the womb to make birth easier. Should abortion clinics be less regulated than tattoo parlors? In a recent editorial, Rebecca Mastee of the Michigan Catholic Conference argues in favor of HB 5711, prolife legislation to regulate abortion clinics in Michigan. What the legislation does do is make sure that any woman who pursues an abortion would enter a facility that is both licensed and inspected by the state of Michigan for health and safety standards. Currently, those requirements are lacking. Of the 32 locations in Michigan that perform abortions, only four are licensed by the state as surgical facilities. As such, the other 28 clinics are not licensed and are rarely, if ever, inspected for basic standards related to cleanliness and a safe, sterile environment. The reforms found in HB5711 are overdue. No person would want to see a loved one, a female relative or friend, walk into a surgical facility where sanitation, cleanliness and confidentiality are, at best, questionable. The public demands better. Women deserve better. Ensuring a safe environment upholds the dignity women expect. During the 36th week of pregnancy, the baby is getting quite cramped in the womb now, but she is still able to move around. What a big change the next month will bring! As with any journey which includes unexpected roadblocks and detours, when you have arrived at your destination there is cause for celebration. Right to Life of Michigan President Barbara Listing said, "Prolife people never gave up, never got off the Prolife Bus. They knew this legislation was needed." The Prolife Bus or Omnibus bill, H.B. 5711, addresses the persistent pattern of neglect in regulating abortion clinic practices in Michigan. There was a long overdue need for governmental reforms. Women's safety was being compromised. But that will change when the Prolife Bus bill is signed into law by Governor Rick Snyder. On December 14, in the wee hours of the morning, the concurring votes were taken in the Michigan House and Senate, both by overwhelming 2 to 1 margins. The last stop for the Prolife Bus bill is the Governor's desk. In the 2011-2012 session, a Partial Birth Abortion Ban was enacted; abortion coverage from ALL insurance plans in Michigan was eliminated; and the first omnibus prolife bill in the history of Michigan was passed. This is historic and unprecedented. Dedicated prolife people and faithful prolife lawmakers made all of these accomplishments possible. It is time to celebrate and thank our prolife legislators with calls and e-mail messages! Late last night, the Michigan House voted 72-35 to concur with changes made in the Michigan Senate. The bill now heads to Governor Snyder for his signature. Ed Rivet, legislative director for Right to Life Michigan, said opponents of the bill intentionally misinterpreted its language to confuse the issue. He said the intent of the law was not to shame women out of abortions through a conversation about the fetus. Rather it was about simply making sure fetuses — whether from an abortion or a stillbirth — were handled properly, he said. “Look, they can’t be thrown in the trash,” he said. The Michigan Senate approved the Prolife Bus, H.B. 5711, Wednesday with a 27-10 vote! Next, H.B. 5711 will go back to the House for a concurring vote (which is a formality) and then to Gov. Rick Snyder for his signature. Your hard work and lobbying has paid off. In addition, the House Insurance Committee passed the Religious Liberty & Conscience Protection Act, S.B. 975. Next, S.B. 975 will go to the full House for a vote. During the 35th week of pregnancy, in preparation for birth, the baby begins to gain lots of weight, about a half a pound every week. The lame duck session in Lansing has been chaotic as expected, but prolife legislation continues to be acted on. Last Thursday, December 6, the Senate approved S.B. 975, the Religious Liberty & Conscience Protection Act. It is now pending in the House Insurance Committee, which could hold a hearing on it Wednesday, December 12. Action by that committee could be followed by the entire House voting on the bill by Thursday, December 13. We need a full lobbying effort to state representatives in Lansing immediately. Generate calls and emails to their offices encouraging a "YES" vote on S.B. 975! Below is a list of the prolife House Insurance Committee members. If your state representative is a member of the committee, extra effort is needed to connect with him or her. Pete Lund (chair), Cindy Denby, Ben Glardon, Joel Johnson, Andrea LaFontaine, Lisa Lyons, Margaret O'Brien, Paul Opsommer, Roy Schmidt, Deb Shaughnessy, Ken Yonker. No one can be forced to purchase or offer for purchase a health benefit that violates one's conscience. No health care provider can suffer employment discrimination for raising a conscientious objection to a procedure, drug or service. No health facility can be required to provide an objectionable service. Make a phone call and send an e-mail message to your Michigan House Representative and ask for a "Yes" vote on S.B. 975. Instead of reading pending prolife legislation in Michigan and then attempting to make an argument against it, the editorial board of the Detroit Free Press has decided to just take the word of Planned Parenthood Mid and South Michigan CEO Lori Lamerand. In a editorial today, they allow Lamerand to falsely claim Michigan's Abortion Insurance Opt-Out legislation isn't clear as to what "elective abortion" is. As for the insurance rider, the language of the provision is murky, Lamerand said. It refers to "elective" abortion, but doesn't really make clear what that means. "As far as we know, it's unprecedented in the country," she said. There's one problem with this argument. The legislation clearly defines "elective abortion." (i) The prescription of or use of a drug or device intended as a contraceptive. The editorial also imaginatively claims that, "Abortion is, by nature, an emergency response to an unforeseen circumstance." The Michigan Department of Community Health released abortion statistics for 2011. Below is a brief summary from the state web site. There was a very slight increase (0.25%) in the number of reported abortions in 2011. Right to Life of Michigan's work is needed to provide life-affirming education and resource referrals to mothers and families facing an untimely pregnancy. A total of 23,366 induced abortions were reported in Michigan in 2011, which was a 0.25 percent increase from the total of 23,307 reported in 2010 but a 52.4 percent decrease since 1987 (the year with the largest number of induced abortions). In 2011, about half of the resident women receiving abortions had no previous induced abortions. In general, from 1985 through 2011, a gradual increase has been observed with the proportion of women reporting two or more induced abortions, going from 14.6 percent in 1985 to 24.1 percent in 2011. The proportion of women who had no previous induced abortion has been generally declining, falling from 59.5 percent in 1985 to 49.7 percent in 2011. The majority of Michigan residents receiving induced abortions (51.1 percent) were under 25 years of age, while 15.7 percent were less than 20 years old. These are much smaller proportions than the 64.6 and 30.6 percent observed, respectively, in 1985. In 2011, 89.6 percent of the Michigan women who obtained an induced abortion were not married, an 8.7% increase from the 82.4 percent reported in 1985. Last week, the Michigan legislature moved on a variety of pieces of prolife legislation including a bill to prevent abortion from being part of standard insurance coverage offered in health exchanges. Michigan women who buy their insurance from state health care exchanges would have to buy separate riders to pay for elective abortions under a controversial measure passed by the Michigan Senate on Thursday. "It was an initiative we'd been working on diligently for 23 months. 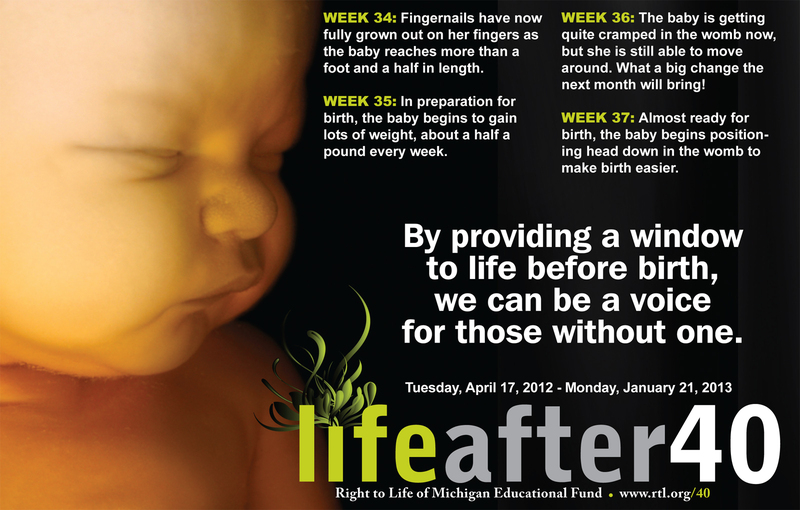 ... We're very, very, very pleased," said Ed Rivet, legislative director of Right to Life of Michigan. "We've lived for 40 years with abortion being built into most benefit plans, and you have to opt the coverage out of the plan. Now, it's reversed. Now, if it's abortion coverage, you can still have it, but you have to add it." 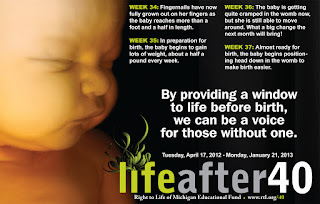 For those who joined Right to Life of Michigan for Life Lobby Day on Thursday, December 6, thank you! Your presence did make a difference. More than 800 prolife people joined together to support life-affirming legislation. Abortion Insurance Opt-Out (S.B. 612, 613 & 614). This legislation passed in the House and Senate on December 6. This legislation is going to Gov. Rick Snyder for his signature. Religious Liberty & Conscience Protection Act (S.B. 975). Passed in the Senate on December 6. The "Prolife Bus" (H.B. 5711). The Prolife Bus Bill is ready for action on Tuesday, December 11. During the 34th week of pregnancy, fingernails have now fully grown out on her fingers as the baby reaches more than a foot and a half in length. A survey conducted by Marketing Resource Group finds that 85% of people in Michigan favor legislation which would require abortion clinics to be licensed and inspected. Currently only a small number of Michigan's abortion clinics are licensed. The majority of abortion clinics are rarely, if ever, inspected. Legislation to require abortion clinic licensing and inspection has passed the state House and is currently waiting action in the Michigan Senate. This survey was conducted by MRG and commissioned by the Michigan Catholic Conference. It sampled 600 likely voters (34 percent Democrat, 34 percent Independent and 30 percent Republican) and has a statistical margin of error of +/- 4 percent. The Michigan Legislature began its three-week "lame duck" session and prolife activists need to mobilize NOW to insure that legislation worked on for the past 23 months is completed before the clock runs out. Earlier this year the State House passed an unprecedented package of prolife bills, led by House Bill 5711, an omnibus bill combining 5 separate prolife bills into one bill (known as the Prolife Bus). A Senate Committee quickly followed suit and moved the bill to the Senate floor. The bill is very close to being ready for a final vote and presentation to the governor, but we must press hard to be sure nothing knocks this bill off course in the chaotic days of the lame duck session. This is a call to rally the troops! To insure these critical prolife bills are completed, we need scores of citizen activists from across the state to come to Lansing on Thursday, December 6. We will convene in Room 426 of the State Capitol Building, beginning at 10 a.m. Briefing sessions with instructions and materials will be held every half hour at 10 a.m., 10:30 a.m., 11 a.m., and 11:30 a.m.
To have a reasonable idea about attendance, we have set up a special email account: LobbyDay@rtl.org to RSVP. Please let us know how many are coming. You may direct questions to that email address, too. Call, email, or write your state representative and state senator in Lansing and ask them to support the Prolife Bus and Abortion Exchange Opt Out bills.